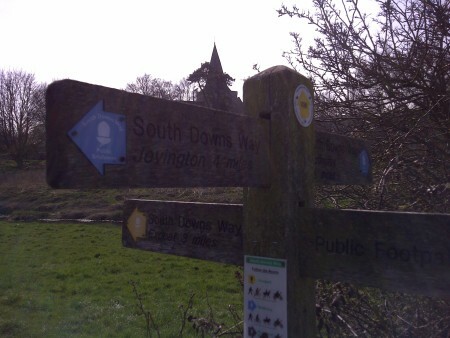 The SDW50 course follows the South Downs Way for miles 6 to 47 of the race. The details below list out sections that are NOT on the South Downs Way in detail, so that runners may prepare for and/ or recce the route prior to race day. Whilst the course will be carefully marked, it is YOUR responsibility to take note of the below and follow the correct course on race day. It is highly recommended that runners carry a map for the race. We recommend the Harvey Map as it is a concise and easy to use copy. It is important to note that OS Map 123: Eastbourne and Hastings is required for the final 3 miles if you will not have a chance to recce it before race day you might consider carrying that also. The course has been accurately measured via multiple Garmin read outs at exactly 49.6 miles. The total elevation gain is 5,700 feet. NOTE: PLEASE PAY EXTRA SPECIAL ATTENTION TO THE ROUTE INSTRUCTIONS UPON LEAVING ALFRISTON, MILE 41. THE COURSE TRAVERSES THE BRIDLEWAY THROUGH JEVINGTON AS OPPOSED TO THE COASTAL PATH ACROSS SEVEN SISTERS - IF YOU MISS THIS TURN YOU WILL GO BADLY OFF COURSE AND END UP RUNNING A VERY SIGNIFICANT ADDITIONAL DISTANCE. Mile 0: The Start is at Hillbarn Recreation Ground. Mile 41: Upon entering Alfriston the SDW joins Star Lane and brings runners out to a T Junction opposite the George pub. The SDW takes a left here, instead runners will turn right at the pub and within 30 metres, make a left turn down a path signed with a brown arrow displaying four place names including 'St Andrews Church'. The aid station is in the Old Chapel Centre otherwise known as the United Reform Church, just 15 metres down the path on the left. Once you have timed in, leave the aid station by turning left down the path and you will be brought out to the white bridge across the river. Mile 41.1: This is the most major navigational point on the course. Once you have crossed the white bridge over the aforementioned river, you will reach a junction and this finger post. Mile 46: On reaching Jevington, runners will need to take a left through the churchyard just before the main road, as opposed to carrying on down the track to the road. Through the church yard will lead you to the front of the Village Hall on the opposite side of the road which is our aid station. You leave by running down the road (left out of the village hall) and rejoin the SDW 100 yards later where you would have emerged at the bottom of the track. Take a left then around 150 yards later at the Tea Gardens. Mile 48 to the finish: On reaching Jevington, runners will be met with the final aid station. Once through the village, runners will head up the SDW which takes the form of a rutted chalk path for a mile until they reach a gate. 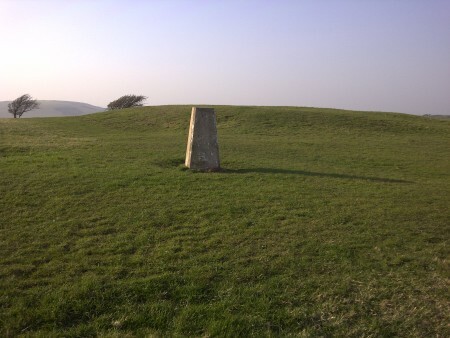 On exiting the gate, runners will see a trig point directly ahead - a concrete rectangular post approximately waist height as shown below. This is mile 98 on the course and is the moment you leave the South Downs Way for the finish. You will be able to make out the track below you in the northern reaches of Eastbourne. It is crucial that you select the correct path when leaving the trig point. It will be marked with arrows and flour on the ground. Continue straight on past the trig point in the direction you have arrived from. Around 20 yards later, there is a path running across left and away down the hill. You can identify it, in that it is a v shape sunken path. Below is a short video of how to locate the right track. Following it down will lead you down a relatively steep chalk path and alongside Willingdon Golf Club which you will look down on to your right. From the trig point to the road is 0.61 miles. The path leads straight onto a short road called the Linkway. About 50 yards further down is a right hand turn on to a bridleway behind Ratton Drive. Follow the bridleway down for 0.4 miles to the junction with Willingdon Drive and cross straight over diagonally left, down Park Lane. When you reach the end of Park Lane you will see Kings Drive in front of you. Turn right at the junction and after a short distance, cross over at the lights. Continue south down Kings Drive and follow the path around to the left as it bends around and becomes a path alongside cross levels way - continue to follow it all the way round. DO NOT take a shortcut through the hospital or university to get to the track. Anyone caught trying to do so will be immediately disqualified from this and all futher Centurion Running events. At the top of Cross Levels Way you will see the university and athletics track car park ahead of you. Continue through the car park to the Athletics Track entrance. Once you reach the track you will see a large open double gate to the right of the main entrance. You must enter through that gate and make a right onto the track. You will complete a half lap around to the far side to reach the finish on the back straight.